The Pirc is an ambitious counter-attacking weapon against 1 e4. Black allows White to build an imposing centre before striking back and attacking it with pieces and pawns. If Black's strategy is successful White's centre can be blown away, but if Black fails he runs the risk of being overrun. 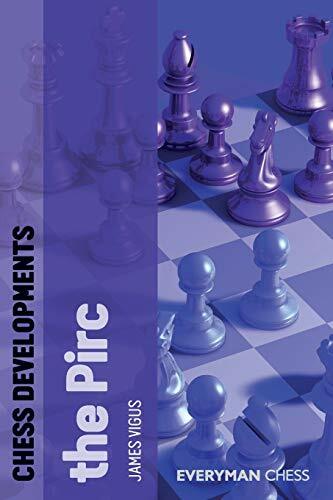 In this book, James Vigus examines the most theoretically important and instructive Pirc games since the publication of his highly acclaimed The Pirc in Black and White, highlighting the main developments and novelties for both sides. Studying this book will provide you with essential information on a popular opening. For serious Pirc players this book will constitute an excellent update on the theoretical status of the most topical lines. The days when the Pirc was a second rate response to 1.e4 are over. While it may never replace 1...e5 or certain variations of the Sicilian as Black's most trusted answer to 1.e4, there can be no doubt the Pirc has entered the main stream and that the books by Vigus are the one's to get if you want to play this defense. Dr James Vigus is a FIDE Master and a former British Junior Champion. His first book for Everyman Chess, The Pirc in Black and White, was hailed by reviewers as an outstanding work.